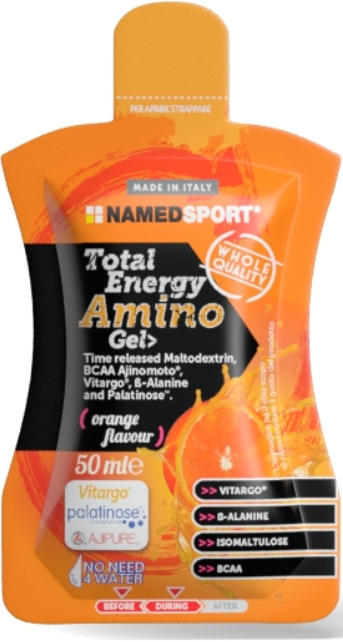 Energy gel from maltodextrin at different release, fructose, Vitargo® and low GI Isomaltulose PalatinoseTM , providing energy as glucose in a balanced and prolonged way. Its special formula features branched-chain amino acids Ajipure®. Glucogenic amino acids Alanine and Glycin have an energetic function by working on glucose synthesis. Water, Fructose 16.69%, Palatinose™ (isomaltulose*) 9.92%, Maltodextrin DE18 9.61%, Maltodextrin DE9 3.20%, Vitargo® (fermented maltodextrin) 2.35%, L-leucine, Acidity regulator: citric acid; L-isoleucine, L-valine, ß-alanine 0.25%, Concentrated lemon juice, Natural orange flavor, Preservative: potassium sorbate; Natural flavourings. *Isomaltulose is a source of glucose and fructose with a low glycemic index. Warnings: food supplements are not intended as a substitute for a varied and balanced diet and a healthy lifestyle. Use during pregnancy is not recommended. Not suitable for children. Do not use for an extended period without medical advice. Do not exceed the recommended daily intake. Keep out of reach of young children. Store in a cool, dry place. The best before date applies to the product if stored correctly in sealed packaging.